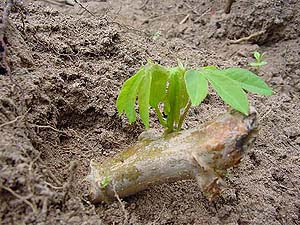 Cassava is an important agricultural crop. It provides food for over 800 million people. Over the past four years Wilhelm Gruissem, ETH Professor of Plant Biotechnology at the ETH Institute of Plant Sciences (1), has directed his research to discovering how this plant can be protected from diseases with the help of genetic technology. Gruissem and his team have now received a science award from the Eiselen Foundation Ulm (2). Cassava (Manihot esculenta)–more widely known as manioc in Europe–is one of the most important agricultural crops. Its root represents the staple food of over 800 million people. Global production is steadily increasing (178.8 million tons in 2001, of which 93.9 m was grown in Africa) and, after rice, maize and sugar cane, it is the fourth most important source of calories for populations in the tropics. 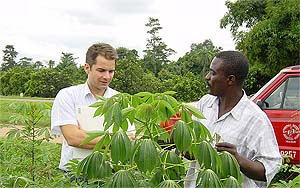 "Cassava is undemanding as far as soil quality, fertilisers and irrigation is concerned," write Wilhelm Gruissem and his assistant Peng Zhang in a specialist article. Cassava is mainly cultivated by small farmers. The leaves provide them with a vitamin-rich vegetable and they use the root to make various starchy foods. Both parts of the plant have to be handled with caution, as they both contain poisonous cyanides. This is not the only problem. "In contrast to other cultivated plants, cassava can be modified only very slightly using conventional breeding methods," say Gruissem and Zhang. The reason for this is that, from a genetic point of view, the heterogeneity of manioc is like our indigenous fruit and grape varieties, and hybridisation therefore brings about totally new varieties. This means that genetic hybridisation is hardly possible. "There are hardly any genetically well-defined reproduction lines. Today's cultivated varieties stem almost exclusively from vegetative propagation." As far as cassava is concerned genetic technology is an ideal alternative to conventional breeding. Gruissem is convinced: "Thanks to genetic technology we can find solutions for some of the most important problems in cassava". - Firstly, pest resistance: "In some parts of East and Central Africa, in recent years the cultivation of cassava has come to a total halt in some areas owing to a viral infection. 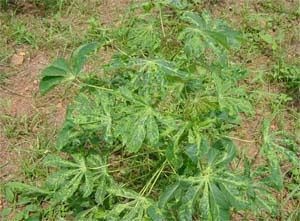 The disease is caused by the Gemini virus, African Cassava Mosaic Virus (ACMV)“, write the experts. This particular virus exists in different genetic variations and is transmitted by the white fly (Bemisia tabaci). Up until now the only way to combat infection has been with massive doses of insecticide. With genetic technology it is now possible to activate the plants own immune system to fight this specific virus. "This is done by introducing small parts of the viral genome into the plant, which either directly attack the virus or trigger a targeted defense reaction," explains Gruissem and compares the result to a vaccination. Three strategies were tested at the ETH Institute for Plant Sciences: blocking the genetic expression of the virus by the means of anti-sense RNA against ACMV proteins, required in an early phase of the infection cycle; the production of a hypersensitive response after viral infection; and the prevention of viral reproduction by induced "gene silencing“. Here the expression of the virus's specific double helix RNA is activated in the plant's own defense mechanism, which either leads to the destruction of viral RNA and/or prevents its expression. According to Gruissem, at the moment the anti-sense strategy is the most far advanced. "A great number of transgenic plants with multiple diverse genetic constructs were produced and tested for resistance to the virus using different methods. Under greenhouse conditions many plant lines demonstrated good to very good levels of resistance to diverse strains of ACMV." Another problem is the larvae of the cassava hornworm (Erinnyis ello). These larvae eat the leaves and cause harvest losses of between 10 and 50 per cent. "Transgenic cassava plants that express CryIA(b) protein from the Bacillus thuringiensis were produced in our lab and are currently being prepared for cassava hornworm resistance tests at the International Center for Tropical Agriculture in Columbia," says Gruissem. - The second example is the extension of the life of the leaf. "Cassava plants often have very few leaves, as they wilt very quickly and die. Leaves age in an active process in the usual run of things, steered by the plant's hormones. A prolongation of this process would increase the number of leaves per plant and so increase harvest. In addition more leaves would also provide more primary food in the form of vegetables," say Gruissem and Zhang. "We have now produced transgenic cassava plants in which a specific cytokinine biosynthetic gene is activated when it begins to age. Cytokinines are plant hormones that can delay the aging process. The transgenic plants really do hang on to leaves longer; every aspect, otherwise observed when the plant ages, is slowed down. The plants produce storage roots earlier than the non-transgenic plants, have higher leaf harvests and, moreover, they can better withstand drought," as the two ETH experts have found out. - The third example concerns improving the quality of the food. Although the cassava roots contain a high proportion of starch, its protein content is not enough to cover the recommended daily intake of essential amino acids. "We have developed transgenic cassava plants that produce an artificial storage protein (ASP1). This protein is an imitation of naturally occurring storage proteins, as, for example, in sweet corn, and its amino acid sequence is optimised to suit human nutritional needs. We are currently investigating the protein content of this plant. At the same time further transgenic plants are being produced in which the specific expressions trigger is modified to produce higher concentrations of ASP1, especially in the root of the plant," is the hope raised by Gruissem and Zhang.